As of presstime, the SANTA CRUZ METROPOLITAN TRANSIT DISTRICT board members were preparing for an "emergency meeting" to meet and discuss the strike--now in its third week. It's been a bumpy road for the estimated 23,000 riders, the striking drivers, the board members and, as of last Friday, the Sentinel, which endured a short but rowdy siege by a crowd of mostly UCSC students angry about what they believe to be the paper's biased coverage. "The Sentinel is lying," growled Councilmember TIM FITZMAURICE into a megaphone aimed at the crowd of hundreds of students and striking drivers at the bus station downtown last Friday afternoon. The charge? Refusing to investigate the board's decision to reject the temporary agreement reached by the United Transportation Union Local 23 and Metro negotiating teams, the state mediator and Metro General Manager LES WHITE. The STUDENT WORKER COALITION FOR JUSTICE, who organized the march, worked overtime to support the striking METRO BUS DRIVERS last week, starting on Monday with a confrontation with Mayor MIKE ROTKIN at his office in the Community Studies Department at UCSC. Then, prior to the rally for the bus drivers last Thursday evening, they protested the 10 UCSC COLLEGE REPUBLICANS and STUDENTS FOR SUSTAINABLE LABOR who were protesting the strikers. 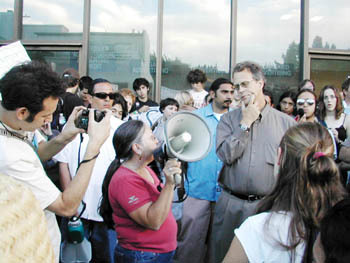 The Sentinel's coverage the following day focused on the 10 protesters and ignored the subsequent rally, which SWCJ member JAVIAR ARMAS said was attended by hundreds of people. And so it was that on Friday at about 6pm, the hundreds of people at the bus station marched down Pacific Avenue and over to the Sentinel office on Church Street, chanting "Get out the way, Sentinel, get out the way!" and "This is what democracy looks like!" while peering in--and pounding on--the windows. "What we're doing right now is de-legitimizing an institution that tried to de-legitimize the strike," said Armas through the megaphone. Though the office was closed, editor TOM HONIG came out to address the group. He was met with jeers and insults. "I'm not going to respond to that kind of language," shouted Honig, sans megaphone, before responding to the accusations of one-sided reporting. "We're telling the truth to the best of our ability. Not everything in our paper is going to be to your liking." Asked why the previous day's rally was not covered, Honig responded, "I honestly don't know why the rally later in the day did not get covered. We're not perfect; in retrospect, it should have been covered." When charged with ignoring stories about citizens in solidarity with the drivers, Honig replied, "If we were a 200-page newspaper every day we could get to every story. Genevieve [Bookwalter, the reporter covering the strike for the Sentinel] answers her own phone, I answer my own phone; we are interested in your stories." "We very much believe in free speech, I appreciate your right to gather," said Honig. "I have listened to your voice, I take it seriously. That's what our democracy is about and I do support you in that." Honig's comments were met with some good cheer, and then a final comment to the crowd by Armas. "We came here and made our point ... so we gotta leave," said Armas through the megaphone. "We gotta leave with dignity though, you know what I mean? But the point is, if we don't feel there's an increase in this journalist's objectivity, we're gonna be back." The crowd left peacefully and respectably, thanks in part to Armas' urging. "See, the problem is, when you protest you aim at people," Armas told Nüz, "and then when they come out, people just want to make them the bogeyman, but you just can't deal with it that way. You look silly." Driver JAMES TAYLOR, who is also the vice chair with the committee of adjustment for the bus drivers' union and a member of the negotiating team, says the reason that Metro bus drivers are striking is because Metro blew off a temporary contract at the 11th hour--one that was approved by both negotiating teams, Metro's general manager LES WHITE, and the union's general chairwoman BONNIE MORR. "So at that time we said, 'That's unacceptable,'" says Taylor, "and then we went on strike the following Monday." "You cannot negotiate an agreement unless you talk to each other," says Taylor, "and we have not seen them since we walked out on strike." Asked what would need to happen for the drivers to return to work, Taylor said the union is looking for evidence that Metro is bargaining "in good faith." "Negotiations would not have to be complete," says Taylor. "We would not have to have a signed agreement, but we would need to have something to show that you are bargaining in good faith this time, because we do not have that faith in you, as you have trashed what we gave to you. The justification for that from the board was, the negotiating team has no authority to make an agreement. The general manager has no authority to make an agreement. The only someone who has authority to make an agreement is the transit board directors. And my mouth fell open." County Supervisor MARK STONE and Mike Rotkin both declared the board's decision "a mistake." "I think we've got a real process problem," says Stone. "It's broken, and we need to find a way soon to get the buses back on the road and get back at the table in a constructive environment." "I talked to a number of drivers who said that they really weren't in favor of the strike, originally," says Stone, "but with a slap in the face like what the board did, just kind of blowing off that offer ... they had no choice but to go out on strike." "Mike Keogh should be fired," says Fitzmaurice of the Metro board chair. "I think that's one clear conclusion we can draw from the events of the last two or three weeks." Fitzmaurice, who says he's ridden the bus every day for the past 10 years, believes the board is structurally flawed because its members are appointed and cannot be recalled or fired until their terms expire. "When a public agency is dysfunctional," said Fitzmaurice last Friday, "you find out about that when they face a challenge like this and they can't handle it. The board has not handled this challenge at all and everybody knows it, even members of the board know it. They can't even get together to meet. The idea that they're going to hold an emergency meeting next Tuesday is ridiculous." "It's too bad that they did not consider this community's needs an emergency," says Morr. "One of the late-night drivers made the comment, 'Do we have to wait a week until we drown before we get help out here?' And we're not comparing ourselves to Louisiana by any means, it just seems that the functioning of our processes or our system is not working." "FEMA," says Fitzmaurice, "their incapacity was old news until we had a disaster. In the same way, we didn't realize how rotten our board was until we had a disaster. They had to face their responsibilities and they couldn't do it. It's a very similar issue." Nüz loves the smell of Triflow in the morning. The popular bicycle lubricant doesn't smell like victory, but it practically reeks of sustainability--a topic that Micah Posner, the director of People Power, can hold court on at some length. Concerned about those bus patrons who are stranded due to the ongoing (as of presstime) Metro Strike, Posner came up with a plan to link civic surplus volunteer time and union resources to provide free bicycles to habitual bus commuters. "It's been a really fast and furious project," says Posner in the happily cluttered offices of the HUB for Sustainable Transportation, "but it shows what we can do as a community when we work together." First taking his idea of a bike giveaway to the bus drivers, Posner was surprised at the level of support that he received. "When I first heard the idea," says Timon Reed, one of the striking bus drivers, "I liked it a lot. The union kicked in $600 for parts and service from the strike fund. We were happy to help out because we want to give back to the passengers that are disadvantaged right now due to the strike. We don't like not providing service." Recognizing that a significant number of those stranded by the bus strike survive on limited resources, Quentin Lindh, a Bike Church mechanic and longtime advocate of sustainable living, is happy with the outcome and objectives of the emergency bike giveaway. "It's really great for the HUB community to be in support of labor by getting to work with bus drivers to advocate for workers and people of lower income being able to live and work in Santa Cruz." On a larger scale, Ivan Denker, another mechanic whose Sunday was spent straightening headsets and truing bent wheels, mentioned that he hopes that this giveaway will raise awareness of the fact that "On a local scale, the bike is a viable commute alternative."